Let the games begin! With 6 plug-and-play hot keys, you can computer game to your hearts' content! Snap-in key placement says, "program me!" for faster game time! The soft touch keys are for a smoother, quieter keyboard. You won't keep your roommate up all night with the constant tap-tap-tapping as you try to finish the assignment on time! 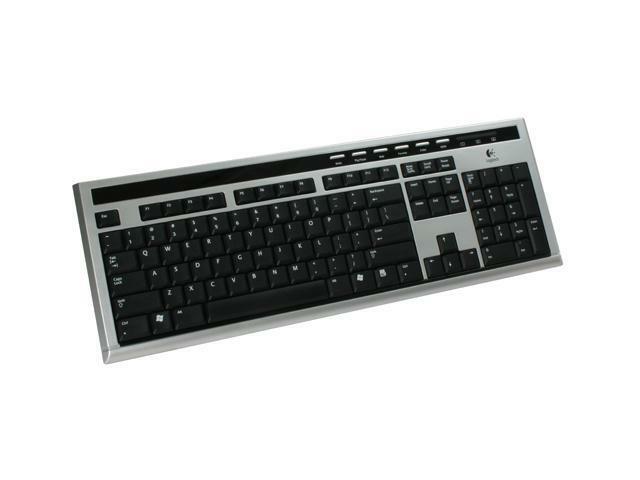 This stylish black and silver keyboard with the USB connection is a great gaming board that can also be used for general purposes, like class work, regular work and email. It is a good all-around input tool for your PC, so order now-you will be glad you did! Standard 104-key Layout The Logitech UltraX features the standard 104-key layout for broad compatibility with computers. Multimedia Hot Keys With the multimedia hot keys, control the volume, play back or pause music or videos at the touch of a button. Now available in a fresh design, the Ultra-X Media Keyboard delivers the ultimate look, feel, and design to any personal computer system. The keyboard works seamlessly with Windows XP and includes all the standard keys and just the most commonly-used hot keys for extra simplicity; just connect the keyboard to the PC and all the hot key features work instantly! Pros: Keyboard mechanics feel perfect. Slim design and low height keys are also a nice touch. Cons: Wish they still made them. Pros: A compact keyboard with the key feel of a laptop. Quick start keys work in Windows XP without special software. Cons: Keyboard shape has pointy corners, could be an issue for users who set the keybord on their lap. No PS/2 adapter suppled, although the keyboard works with them. Other Thoughts: Purchased from Newegg, arrived well packed in a few days. Pros: Laptop style keys, standard keyboard layout, quiet enough. It's just a keyboard really. Hotkeys aren't too useful, they could have been placed better though. Cons: Seems pretty difficult to clean but that doesn't really make much of a difference anyway. Pros: I order 4 of this keyboard. Is really a laptop keys. Even when you pop out the keys and look under it. (start from upper left and right corner of a key.). Cons: The 6 hot keys doesn't have "up and down" volume key. Other Thoughts: It works great on Team Fortress 2. I am able to turn correct holding 2 key down. Pros: Works well, lasts considerably long, cheap, thin, doesn't have 30 hotkeys. Cons: Annoying shallow laptop keyboard clicking sounds, has useless media keys (a strange selection: Media, Play/Pause, Mute, 'Favorites', E-Mail, 'WWW') that don't necessarily work, but, you know what you're getting from the pictures here. Other Thoughts: Owned two, one of which was supposed to be for another computer, but one had keys suddenly start to die (I press, no response), and so it became useless to me, and I had to use the other. Pros: Looks nice and is enjoyable to use sometimes. Wasn't a DOA. Cons: Keys jam up, just don't work half of the time, and can not be cleaned very effectively. Other Thoughts: I admit that if I used it in Intel's fabrication room, it would have been a great keyboard. Back to the trusty 6 year old PS/2 keyboard. Pros: This is exactly what I wanted in a keyboard. It's quiet, the key travel is minimal (think laptop keyboard), and it doesn't have a bunch of unneccessary buttons, dials, nobs, and whatnot decorating the rim. While it does have media buttons I don't use (I think Mute is the only one I've pressed), there aren't very many and they're subtle. The key strikes themselves are very quiet, just a light tap, and they keyboard itself is fairly light but also nice and sturdy. I have no fear of breaking it. Other Thoughts: The feel of the keyboard is great. I can type for hours on this thing and my fingers are fine. If you like the light touch feel of a laptop keyboard (not everyone does), this is just like that. I spent months looking in big-box stores for a keyboard like this, and finally took the plunge and ordered this from NE based on pictures and reviews. I was not disappointed. I will probably be ordering a second one to take to work. Other Thoughts: Needed to update to a USB keyboard finally since i've been usung a PS2 one for to long.